Enjoy an unforgettable Thunder Thrill Ride and extend their excitement with the SKYWALK high attitudes adventure at Sydney Tower Eye! After your super exciting jet boat ride around Sydney Harbour you'll be walking on air 268 metres above stunning Sydney, with the city streets directly beneath your feet. Look down through the glass floor viewing platform for a bird's-eye perspective of the bustling city below, as part of a 45 minute guided tour around the outside of the iconic golden turret of Sydney Tower. 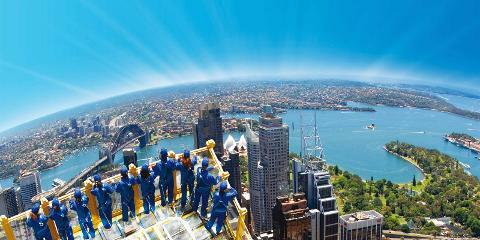 Let them experience Sydney the extreme way they've never thought of! 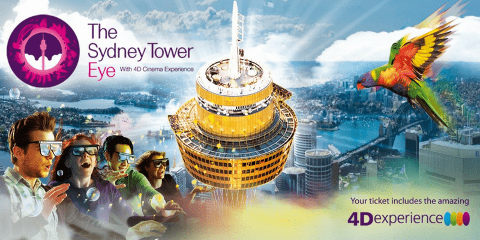 Sydney Tower Skywalk & Thunder Thrill Gift Card include a 30 Minute Thunder Thrill Ride, Entry Ticket into Sydney Tower Eye Internal Observation Deck, 4D Cinema Experience & the 45-minute SKYWALK high attitudes guided adventure. Valid for 1 year from purchase, recipients can simply call or book online to redeem the voucher at any time. Experience Hours: SKYWALK departs on the hour between 10am - 8pm (spring & summer) and 10am - 7pm (autumn & winter). Children Ticket: All children participating in SKYWALK must be accompanied by a parent or guardian aged 18 or over. Children 8-10 years inclusive require 1 adult per child. Children 11-16 years inclusive require 1 adult per 3 children. Please ensure Adult tickets are purchased when booking children tickets for this experience. Children aged 17 years can participate without an adult present but must have signed parental permission - Please download the parental consent form here (PDF). Form and photo copy of ID must be presented at time of SKYWALK. Key information: After your jet boat ride, you are advised to call SKYWALK reservation team to pre-book your SKYWALK tour. All guest must arrive at least 45 minutes before the selected SKYWALK tour session. For more info, please be welcome to visit SKYWALK FAQ page.